Joanne McAndrew’s first solo exhibition, Ciúin, opens on 30 October 2018 at Connolly Hospital in Dublin. Having grown up in Blanchardstown and currently living there now with her own family, she has spent many hours in the hospital for various reasons and is delighted to have this opportunity to exhibit and contribute to arts and health in the hospital. Joanne McAndrew specialises in landscape and figurative painting. She has taken part in group exhibitions in the National College of Art and Design (2012 and 2013) and in the Zozimus Gallery on Francis Street (2017). 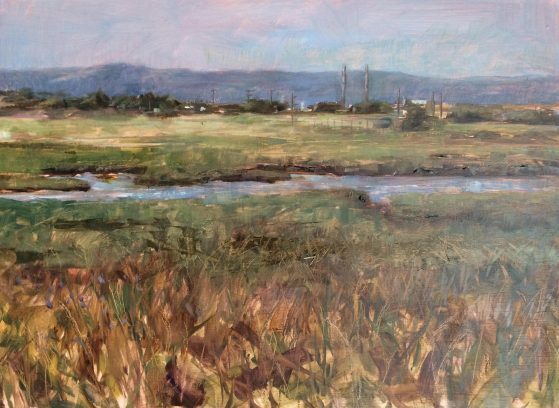 You will find Joanne exploring the coastline and canals of North County Dublin and further afield, where she paints “en plein air,” a French expression meaning “open air”. Plein air paintings are rendered on-site, outdoors, in the elements, yielding a strong sense of immediacy. Preferring to work directly from life, Joanne feels that direct observation within the environment allows a certain quality to be captured in a painting. Studying the nuances of light and shade and working in an ever-changing environment presents an alluring challenge that draws her back time and again. She has the ability to quickly capture the essence and spirit of her subject. Joanne also draws her inspiration from the human form, regularly painting and drawing the figure from life. She facilitates a weekly life-drawing session in Malahide and also attends life-drawing sessions in the Royal Hibernian Academy (RHA) in Dublin. Joanne has been studying painting and drawing in NCAD and the RHA since 2011. A regular participant of the Dublin plein air painting festival for many years, Joanne received two awards this year: first prize for her painting “Ballbriggan Harbour” and second prize for “Malahide garden lawn”. In 2017, Joanne was the runner up in RTE’s television programme “Painting the Nation” in which seven contestants painted their way around Ireland. Opening: Tuesday 30 October, 3pm, launched by Una Sealy. Location: Level 3, Connolly Hospital. Ciúin runs until 21 December 2018.